It's a multicloud world, we're just managing it. After initial resistance, the IP, and more broadly network, infrastructure market has begun its love affair with multicloud in earnest. During the Gartner IOCS events last fall in Las Vegas and London multiple analysts expressed how the maturing of network management includes not only cloud, but the use of multiple cloud vendors within a network architecture. What is a multicloud network? Why choose (or learn about) multicloud? What are the advantages (and disadvantages) of multicloud networks? In this series we'll answer those questions, and more - from business use cases to vendor-specific (AWS, Azure, VMware) implementations. 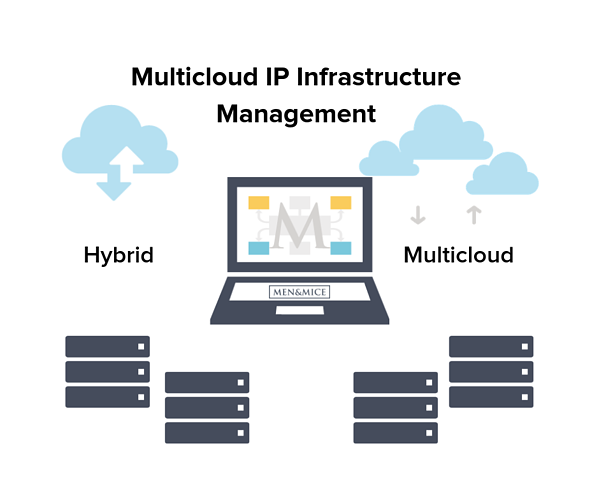 Simply put, 'multicloud' is the use of multiple cloud environments within one network. or a hybrid network utilizing both on-prem infrastructure and more than one cloud service. For network managers, the multicloud’s advantage is diversity of supply chain and distribution of resources. In addition, multiclouds offer automation for streamlining task loads and eliminating misconfiguration (human error) as well as adding redundancy to protect against attacks, all while ensuring a backend-agnostic implementation of cloud network technology. Both cloud-native and external support IPAM and DNS services benefit from a multicloud management approach. Cloud networks can do many things, but there's no vendor that does everything for everyone. For example, some may offer robust facilities for IP addresses but lack the requirements for a proper DNS solution. Another vendor’s great infrastructure for running DNS may lack the necessary pool for allocating IPs. Due to this, and the desire to capitalize on best-in-class solutions for complex network needs, cloud adoption often naturally turns to multicloud. With overlay solutions that integrate with compatible APIs configurations can be freely migrated, replicated, and scaled - therefore creating agility. Companies who take advantage of multicloud with the visibility of overlays have better tools to achieve better resource utilization across the board, and easier migration and scaling processes to meet business demands, rather than limit them. Furthermore, multicloud networking offers better redundancy - a key for security and reliability. When it comes to failover, redundancy is key. Dangers from both inside (such as human error) and outside (malicious DDoS attacks or simply hardware failure) can render networks unusable unless they can offload workloads seamlessly. In the unlikely event of all things going wrong, any one cloud service’s all-encompassing SLA may still have blind spots for your network setup, particularly since you may be using those various services to cover a multitude of different needs. But a multicloud environment, and more so a hybrid environment (in this case we mean a mix of on-prem and cloud/multicloud), can offer reliability by enabling the distribution of resources (i.e. eliminating single point of failure in the network supply chain). To take advantage of multicloud networks, businesses need solutions that are widely compatible and capitalize on cloud-native functionality. Without the former the range of options is limited (defeating the purpose of multicloud) and without the latter much of the ROI of the process is lost (due to limited efficiency). Men & Mice develops network management solutions at the DNS, DHCP, and IPAM level. 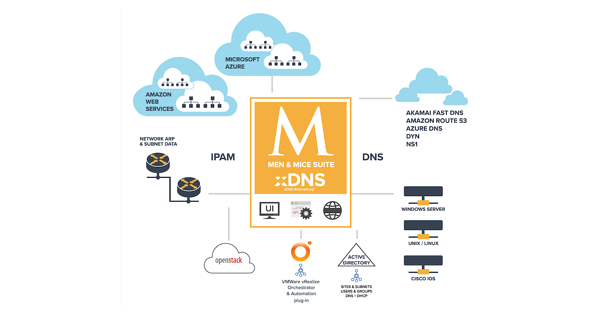 Like a multicloud, the Men & Mice Suite has been designed to be widely compatible and backend-agnostic, beginning with on-prem compatibility with Windows, Cisco and Linux/Unix then into the cloud with AWS and Azure as well as several cloud DNS services like Akamai FastDNS, DYN, NS1, Amazon Route 53 and Azure DNS. Instead of relying on a specific vendor or technology (or even a select few of them) we've focused on facilitating the communication between them while also offering a powerful management solution within the Men & Mice Suite. The Men & Mice Suite is API-driven, software-based solution that integrates cloud-native resources and functionality. We know that creating a network focused on strengthening business progress means creating a complex network. Our focus is on simplifying these complexities in the network management process-- helping the network help the business. After this overview, in the coming weeks we'll be examining the particulars of multicloud environments and networking. Whether you’re looking for platform-specific information, business use cases, or technological discussions, you’ll find it in this series. Subscribe to our blog updates to make sure you don’t miss anything, and let us know if at any point you’d like to know more about a particular subject.